Fake Mexico is a relief after months on the hook in Zihuatanejo and traveling for over a week through remote parts of real Mexico. What fake Mexico means to the girls is swimming pools, air conditioning, and white, slightly pouchy, North American kids on winter break with their parents. What it means to DrC and I is unlimited fresh water to wash the boat in the morning followed by drinks at a swhttp://www.blogger.com/post-create.g?blogID=38495401im up bar in the afternoon. Fake Mexico has green lawns, obsequious waiters who quietly tolerate obnoxious drunks, and no graffiti. The groceries stores go by names like C.C.C. (pronounced say-say-say) and Sorianas, and they all look precisely like WalMart. In fact, the stores are so familiar they even go by names all would recognize such as... yes... WalMart. And Costco, Domino's Pizza, and Burger King. There are many reasons we do not spend a great deal of time in fake Mexico, though I'll admit that probably the most important is financial. Fake Mexico costs about the same as Real United States. We had heard about this phenomena even before leaving. Apparently, fake Mexico used to be considerably cheaper but – perhaps because of NAFTA, perhaps because the Mexicans have just figured it all out – goods in fake Mexico are basically the same price as your average bar, mall or hotel up North. Now if you are one of those folks who can afford to live at a hotel 24/7, then pricing in fake Mexico won't pose a problem. Cruisers on a budget, however, need to be more frugal with the cruising kitty and so spend more time in real Mexico where the food and fuel budget drop by at least half. Another problem with fake Mexico is that it misses the entire point of traveling aboard. You can't really tell the difference between a bar in fake Mexico and one in San Diego or Miami. I say those cities deliberately because I sometimes think more Spanish is spoken in Miami or San Diego than in Nuevo Vallarta or Las Hadas. You could spend a week in Ixtapa and never go to a taco stand or mercado. You can pull up to the dock in Mazatlan, spend a month in El Cid, and never experience the zocolo, see the cow carcasses hanging from the rafters of a carneceria or browse through a fabric warehouse. Even the décor feels more like a Disneyland interpretation of ancient Mexico then anything you would find in the villages, towns, and incredibly busy cities of the real country. One of the more surreal aspects of fake Mexico are the licensed street vendors selling tchotkies and mementos along the water front. If you spend any time in real Mexico, a quick browse of the wares at the hotels reveals both their very low quality and premium pricing. Real Mexican markets involve haggling, competition, and cacophony. Contrasted with sun burnt visitors quietly picking over the goods of one or two sellers, it feels as though all the energy and vitality has been bled out of the system leaving only a pale, hollow echo. I want to shout at these travelers, “Get out of the hotel! Go to town!” A 5 peso bus ride and 20 minutes will put you in the heart of Manzanillo, Mazatlan, or Zihuatanejo. The goods you see here are pathetic, limited, and expensive. In town, you'll find literally hundreds of shops and vendors, the streets so full of commerce and a spirit of entrepreneurial energy, the money will just leap out of your pocket in exchange for incredibly fresh fruit, large glasses of cold jugo, vibrant shirts, plates, and rugs. 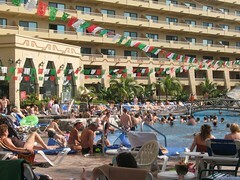 But despite our scorn for fake Mexico, sometimes we flee into it as a vacation from our cruising life. 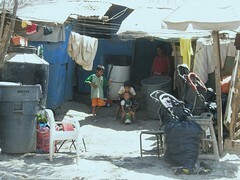 Real Mexico is dirty, hot, and hard work. The streets are cobblestone or dirt, graffiti covers the walls, and it's hard to make ourselves understood. It's loud and smoky, busy and crowded, and it often smells. Probably most significantly, all the marinas are in fake Mexico. So if we want to dock up for water, provisioning, or simply a night of not moving, we have to step out of reality. We're forced to compromise, spend the money for a tie up, and slip into the creations of Singlar and Fontanur. Terrible compromise that is... sometimes we just have to swim up to the bar if we want a beer.